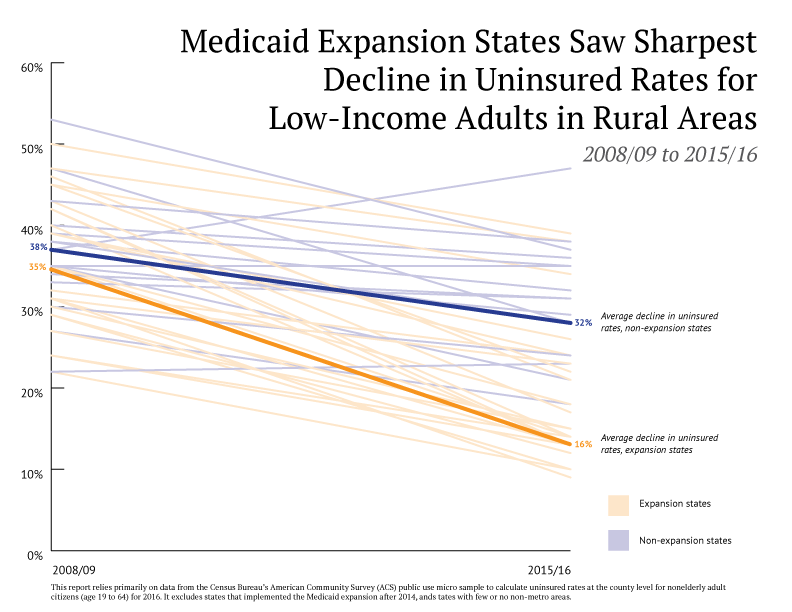 Uninsured rates for low-income adults in rural areas declined 3x faster in Medicaid expansion states compared to non-expansion states, according to @georgetownccf report. The uninsured rate for low-income adult citizens (below 138 percent FPL) has come down since 2008/09 in nearly all states, but small towns and rural areas of states that have expanded Medicaid have seen the sharpest declines. The uninsured rate for this population dropped sharply from 35 percent to 16 percent in rural areas and small towns of Medicaid expansion states compared to a decline from 38 percent to 32 percent in non-expansion states between 2008/09 and 2015/16. States that experienced the biggest drop in uninsured rates for low-income adults living in small towns and rural areas are Arkansas, Colorado, Connecticut, Hawaii, Kentucky, Michigan, Nevada, New Mexico, Oregon, and West Virginia. Non-expansion states with the highest rate of uninsured low-income adults in small towns and rural areas are South Dakota, Georgia, Oklahoma, Florida, Texas, Alabama, Missouri, and Mississippi. Two states that more recently made decisions to expand Medicaid—Alaska and Louisiana—are also among the states with the highest uninsured rates for low- income adults in non-metro areas. The non-expansion states with the biggest coverage disparities between rural areas and small towns and metro areas are Virginia (which recently decided to expand Medicaid), Utah (which will vote this fall on a Medicaid ballot initiative), Florida, and Missouri. The experience in expansion states demonstrates the great opportunity for these states to bring down the uninsured rate in small towns and rural areas and narrow the gap between metro and rural areas. Medicaid has been a key factor in lowering the percentage of Americans who lack health insurance. Nationally, the uninsured rate for all Americans under the age of 65 (adults and children) fell dramatically between 2010 and 2016 from 18.2 percent to 10.4 percent, rising slightly to 10.7 percent in 2017.1 Expansion of Medicaid coverage and the new availability of subsidized private insurance from the health care marketplaces helped drive down the uninsured rate, in turn strengthening the health care providers who treat these individuals. Download and read the press release here. for Health Statistics, May 2018), available at https://www.cdc. gov/nchs/data/nhis/earlyrelease/insur201805.pdf. J. Hoadley et al., “Medicaid in Small Towns and Rural America: A Lifeline for Children, Families, and Communities” (Washington: Georgetown University Center for Children and Families and North Carolina Rural Health Research Program, June 2017), available at https://ccf.georgetown. edu/2017/06/06/rural-health-report/.
. Foutz, S. Artiga, and R. Garfield, “The Role of Medicaid in Rural America” (Washington: Kaiser Family Foundation, April 25, 2017), available at https://www.kff.org/medicaid/issue- brief/the-role-of-medicaid-in-rural-america/. R. Cohen, E. Zammitti, and M. Martinez, “Health Insurance Coverage: Early Release of Estimates from the National Health Interview Survey, 2017” (Washington: Centers for Disease Control and Prevention: National Center for Health Statistics, May 2018), available at https://www.cdc.gov/nchs/data/nhis/ earlyrelease/insur201805.pdf. R. Garfield, A. Damico, and K. Orgera, “The Coverage Gap: Uninsured Poor Adults in States that Do Not Expand Medicaid” (Washington: Kaiser Family Foundation, June 12, 2018), available at https://www.kff.org/medicaid/issue-brief/the- coverage-gap-uninsured-poor-adults-in-states-that-do-not- expand-medicaid/. Delaware, New Jersey, Rhode Island, and the District of Columbia were excluded from the analysis because they have no micropolitan or noncore counties. Massachusetts was excluded because less than 2 percent of its population resides in counties that are micropolitan or noncore. These states are: Arkansas, Idaho, Iowa, Kentucky, Maine, Mississippi, Montana, Nebraska, New Hampshire, New Mexico, North Dakota, Oklahoma, South Dakota, Vermont, West Virginia, and Wyoming.